Looking at this charming boy’s birthday party is as refreshing as taking a deep breath of fresh air! Amanda De Santis, of Red Wagon Events, styled this delightful Hot Air Balloon themed celebration. A backdrop of stylized clouds and a giant hot air balloon established the mood for a bountiful menu, companion decorations, and gracious favors for a wonderful first birthday celebration. Soar up to the clouds with this Disney’s UP First Birthday Party! You’re going to love the inspirational details in this Elegant Boy’s Hot Air Balloon Christening Party. Oy Photography was there to capture the memories. Peaceful blue and white is energized with bolts of bright red to create the perfect setting for an abundant dessert table — and what outstanding desserts! Cake-a-lishioush created the marvelous piece-of-sky centerpiece cake and the darling, coordinating cupcakes. Fanciful cloud shapes and filigree are the perfect accompaniments for the hot air balloon on top. Wouldn’t you love to sample the desserts by Sweet Empire? They created tiramisu pots (a coffee flavored Italian dessert), chocolate salted caramel surprise macarons, white chocolate couverture tarts and white chocolate couverture cake pops. Yum! Notice the cake pop sticks are a clear acrylic? I love how that tiny detail adds to the ethereal vibe of the table. Sky blue Jello pots, a variety of candies plus chocolate bars, wrapped with a love note from the birthday boy, augment the display to tantalize guests! Red ribbon and party medallions add to the festivities and food labels thoughtfully inform guests of potential choices (I think I’d want some of everything!). Pretty and Print was the go-to for all of the terrific graphic designs. I especially like their choice to use patterned lines in the background sky and the curlicues of the clouds that convey the impression of movement. They could have just used solid blue and white, but the patterns are much more interesting. The savory station was a Souvlaki Bar where guests could choose their own grilled meat and veggies. The colorful Beverage Station shared the space and the table was backed with an additional sky view and decorative hot air balloons . Guest tables were a mix of solids, stripes and polka dots in the theme colors. The kid’s table looked especially cute with just the right size seating, embellished beverage bottles and party hats. So they could take a piece of the party home with them, thank you favor boxes were ready for filling by departing guests. 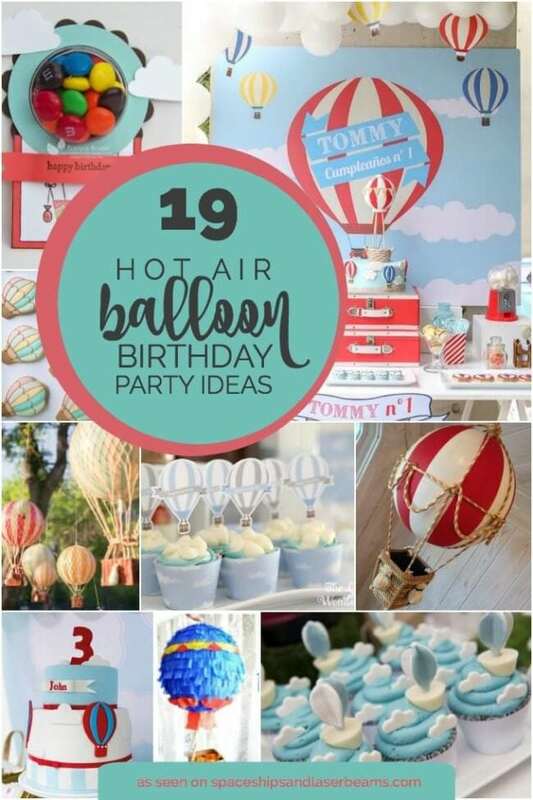 With the unspoken message of new beginnings, the hot air balloon theme is a popular choice for celebrating a boy’s first birthday. Amanda’s styling, choice of colors and vendor partners made this birthday one to remember. Hot Air Balloon First Birthday!